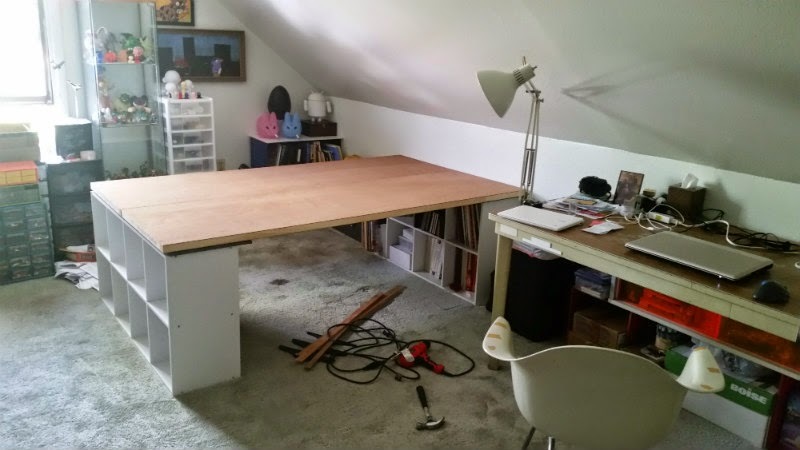 I've decided to start working on a gaming table in the attic. After (far too much) consideration, I decided to go for a quick & easy solution first, with the option to switch to one of my more complex ideas later. This has several benefits: I will get a decent gaming surface in play pretty quickly, and everything can be "upgraded" in phases. So before I started overthinking, I picked up the minimal basics while I was running some errands today: one more set of cube shelves and two flush hollow core interior doors. Next step will be to texture and paint them. I've already got the glue & sand from a previous project. Here's a couple of pics of them in place. Please excuse the mess. I'm still in the process of cleaning, unpacking, setting up & organizing the attic. My painting/sculpting table off in the opposite corner, on the left side of the second photo. and for an attic, it seems to have great light! Haha. I'm used to getting around up there, though I usually keep to the center of the room. We'll see how well I do. I was thinking about making a couple of low stools, since the table top is slightly lower than a typical table as well. The light is decent, especially considering that is the only window. Unfortunately, because it is the only window (and the awful "insulation") I will be partially filling it with a portable AC unit, otherwise the attic would be unusable in Summer. 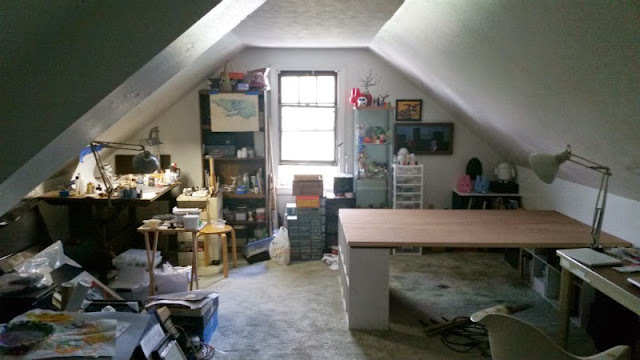 However, it's definitely better than no room at all, and although it has taken a few years to start cleaning it out, I'm feeling pretty good about it!